Become more energetic using hypnosis! Stop feeling too tired all the time and start achieving your goals! Be unstoppable. Be a WINNER !!!! 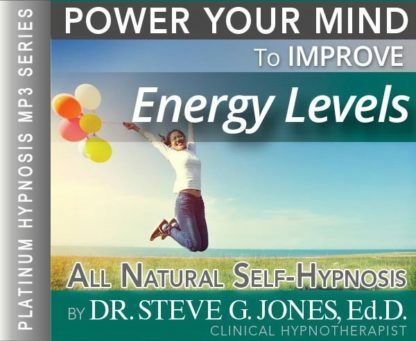 Increase Energy Levels Hypnosis MP3 is an all-natural way to increase energy. All too often people rely on dangerous stimulants to boost their energy levels. These drugs include caffeine, sugar, and even diet pills and prescription drugs. This false and short-lived energy is nothing like the energy from within that can be obtained through hypnosis. The reason self hypnosis works to increase energy, and not just in short bursts, is that it does not rely on substances being added to the body. After all, anything that goes into the body will eventually wear off or be eliminated. Those stimulants also often result in dramatic “downs” to go along with those energizing “ups” obtained through artificial means. Hypnosis is a multi-step process that is practiced each night for 21 days. Through hypnosis the listener is brought to a relaxed state and then an even deeper state of relaxation in which they are able to shut out the world around them enough to focus on the messages that can give them lasting energy. Even just the initial stages of hypnosis are therapeutic in helping to increase energy. That is because the deep relaxation that occurs in these phases is refreshing on its own. However, the stage of hypnosis referred to as the scripts stage is where the messages needed to add energy to your day are introduced on a repetitive basis. After just three weeks, new behaviors will be ingrained and you will probably only need to refresh yourself through the self hypnosis on an occasional basis. 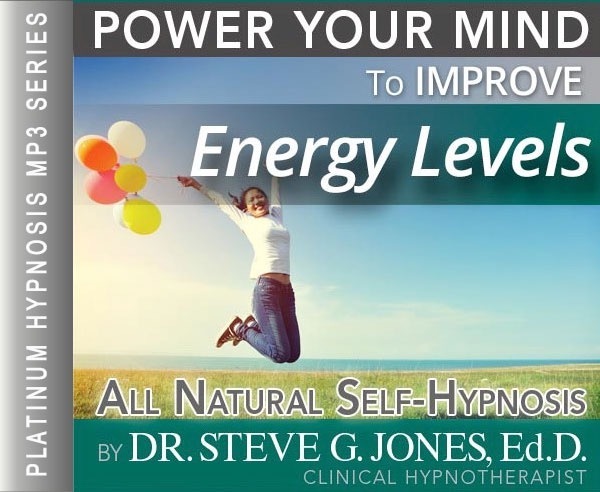 Steve G. Jones, a clinical hypnotherapist has created a self-hypnosis program called, “Increase Energy.” The script found within the Increase Energy Levels Hypnosis MP3 audio will address the mental issues that often zap you of physical energy. It is mind over matter once again when it comes to being the best you can physically be. Steve G. Jones, Ed.D., Clinical Hypnotherapist, charges $1,500 for a custom recording and $25,000 for a one-hour private hypnotherapy session at his office. But you can get all the benefits for this low price. Simply listen to the Increase Energy Levels Hypnosis MP3 session every night as you go to bed for three weeks and feel the changes happening in your life. You will feel more empowered, more in touch with your true self, and you will truly know that your goals are within your reach. You know that feeling when you have received a full night sleep and you wake up so refreshed and energized? Don’t you wish you could feel energized every morning you wake up and throughout your day? It is a great feeling to be energized and to feel as though you can accomplish anything. We all know what it feels like to have a day when you’re tired and you can’t focus or concentrate on anything. There is nothing fun about feeling fatigued. If you feel as though you are lacking energy, several things could cause your fatigue. Lack of energy can be caused by depression, health problems, eating unhealthy foods, and lack of exercise. If you want to work on increasing the amount of energy you have, you might want to start by making small changes to your diet and activity level. If your fatigue continues you should talk with your doctor. Lack of energy is your body’s way of telling you something isn’t right. You deserve to feel energized every singe day! Living busy and hectic lives often leaves us feeling tired and not having the ability to get things done. Many people find themselves searching for ways to increase their energy. They often feel like they have the motivation to complete things and the confidence in themselves, but they lack the energy. There are many changes you can make in your daily life in order to increase your energy. I know you have heard it all before but diet and exercise has a major impact on your energy levels. Eating healthy and exercising will actually make you feel like you have more energy throughout your day. Another way to increase energy is to participate in an activity that makes you happy and energizes you, for example meditation, yoga, or any hobby that stimulates your mind, body, and spirit. And as you relax deeper and deeper and even more deeply relaxed, you realize just how powerful you are. I’d like you now to imagine your mind as a computer and your body as an electrical station. You’ve seen those electrical stations that power entire cities, that’s right. They are so powerful that there is a fence around them because the energy coming from them is so intense. And that is how I would like you to imagine your body now. So your mind is a very powerful computer and your body is an electrical station, that’s right. I would like you now to imagine typing into the keyboard, the word “energy.” Type it in now and it shows up on the monitor and you hit enter, and when you do, there is a buzz coming from that electrical station that is your body. The energy increases. And at anytime that you feel that you need more energy all you have to do is think the word energy and feel the energy surging through you body just like an electrical station and you are able to maintain this energy as long as you desire because you get the proper rest. You also get the proper exercise and you eat appropriately. All this allows you to have energy when you want it. See yourself type the word energy again on the computer in your mind, the computer that represents your mind. And as you hit enter, feel that energy surge through your body, that’s right. Feel that energy. Day by day you are getting better and better at thinking the word energy and having increased energy. The more you listen to this recording and practice, the better you will become at having more energy so that very soon indeed you will be able to do this all by yourself at anytime, maintaining that energy surge as long as you need it. You are able to increase your energy easily and naturally and quickly and at any time that you need it for as long as you need it because you treat yourself correctly. And you have programmed yourself to respond to thinking the word energy so relax now and get that rest. Relax now and get that rest and build up your energy, that’s right. Relax and relax and recharge. We all want more energy in our lives! There are probably times in your life or during your day when you just don’t have the energy to do what you need or want to do. It should not be that way and it does not have to be that way! You deserve to feel energetic in aspects of your life. Imagine waking up and feeling energized to take on your day. The Increase Energy Levels Hypnosis MP3 recording will help you get your energy back so that you can feel motivated throughout your day. Hypnosis is a great tool to use to help increase your energy. The hypnotherapy session will first relax you into a relaxed hypnotic state and then Steve will use his expertise in giving your powerful suggestions, telling your body it has more energy.